This is possible mainly with the online version of the guide, which works as a sort of school search engine. The point here is that the Province of Rome has just duplicated a service called “Scuola in Chiaro” (“school in full view”) launched three months ago by the italian Ministry of Education, without showing any signs in the official announce that the Province knows about that State initiative, or that the two projects are in any way connected or collaborating. Not only that, but unlike Scuola in Chiaro, whose database was almost immediately licensed as Open Data (CC-By), the Province service only carries the usual “copyright 2012…” notice.Why doesn’t the Province of Rome publish Open Data? Oh, and which data is the Province using? Because if it’s using the ones by Scuola in Chiaro, then they should say it clearly, to comply with their license. The problem, however, is that the two databases do not contain the same data, thus leaving families with different and conflicting school information, depending on which official website they find first. 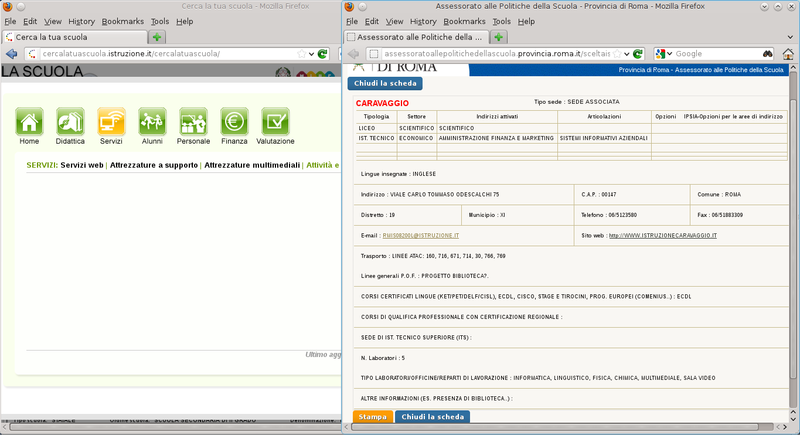 One proof of this, shown in this screenshot, is the Ilaria Alpi Public High School in Rome. According to its own website, that school has certain facilities and nearby public bus stops, according to the Province it has others, and nothing whatever according to the Ministry. Who is right? And how can parents and students decide? Money aside, just two weeks ago there was an uproar in Italy, with cries of scandal, censure, incompetence and what not, because the Ministry of Labour asked a provincial department to shut down its own website on the ground that… its service was already offered (in theory, not in practice) by the central administration, and therefore the provincial website should be closed in order to guarantee a “UNIFORM representation of institutional information”. Eventually, that website was restored, even if the case isn’t closed, but I’m really curious to see if the Ministry of Education would try to go the same route, and if the several parts of the Italian Governments will adopt one common policy for such cases. As far as these school databases are concerned, however, the solution is, in my opinion, far simpler than it might seem. In and for itself, there is nothing wrong with the proliferation of public and private websites offering the same function, in this case the search of the best public school for a student. Indeed, the more the better: only competition gives the best guarantees that at least one will turn out really functional and easy to use. This, of course, is only true as long as, when such “duplications” are set up by a Public Administration, they do it only if they have really good reasons to justify the cost of “duplication”, publish online those reasons and costs and reuse as much software and data as possible. And as long as all those websites can used as base the same raw data, published once and as Open Data by official sources. This, the mismatches between those official websites do not prove that Open Date can not be done or is not appropriate. First, because seeing those discrepancies proves that there is confusion and shows how and where to fix it. We are lucky to have all these conflicting and incomplete data online! Otherwise, families, Province(s) and Ministry would have continued for who knows how long, to make decisions and spend public money, on the basis of incorrect or incomplete data, without speaking to each other and without even realizing it! In the second place, at least in this case it is particularly simple and economical to eliminate any confusion. The correct and up to date data are inside each Public School, so it is a direct responsibility of each principal to make them available. The only thing that needs to happen (cost = almost null) is that the Ministry makes it mandatory for the principals to insert, and update at least every quarter, ALL those data in the central database and then fines the principals whose schools are not compliant. The website to insert the data, and the database itself (which already exists!) should be implemented and managed by the Ministry of Education, both to make sure that uniform, comparable data are collected across Italy, and toh to reduce costs. All is needed is one Web form, as a frontend to an already existing database: even if it’s extremely easy and cheap to do, why do it more than one hundred times, one for province. Would it be too easy and cheap? « Italian Students, please give away your ebook slogans!